We’ve teamed up with Animal Planet to launch a #31DaysOfRescueDogs campaign to help homeless pets. Get started by following the easy instructions below! Tell your friends, family, coworkers, and social media followers that you are taking part in 31 Days of Rescue Dogs campaign. Post one photo of your favorite rescue dog for 31 days on social media channels (Instagram, Twitter, Facebook) using the hashtag #31DaysOfRescueDogs. Here are some ideas and sample posts! ● What inspired you to join #31DaysofRescue? ● Share a photo of your dog drooling for your human food! #ICanHaz? Full 30-day calendar available for download on your 31 Days Of Rescue Dogs Campaign Dashboard when you create a campaign page! Encourage your friends to donate $1 a day in exchange for 31 days of adorable photos ($31 goes a long way for shelter dogs in need!). And, let them know that everyone who donates will get a dedicated 31 Days Of Rescue Dogs temporary tattoo! 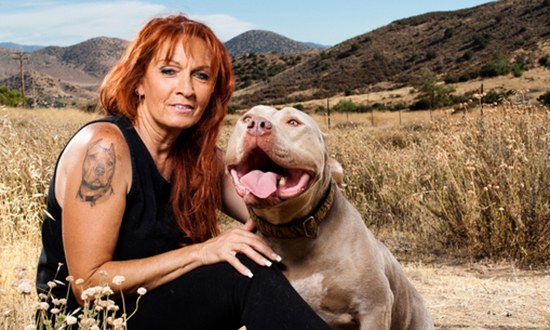 Share your favorite photos for a chance to be featured on Animal Planet during the Pit Bulls and Parolees marathon. The top three fundraisers will win prizes from the ASPCA and our great partner, Animal Planet. Do you need to have a dog to participate? No! Photos of all dogs are welcome, whether they’re adopted, fostered, or even a dog in need of a home. Everyone is invited to participate and make a difference. Get started on your campaign for #31DaysOfRescueDogs today! Social media shy? Don’t worry, there are plenty of other ways to fundraise for the ASPCA and help shelter dogs in need. Whether you hold an in-person event or a virtual fundraiser, Team ASPCA is here to help make sure that your 31 Days Of Rescue Dogs Campaign is as fun and successful as possible. What is in the Online Toolkit? The free Team ASPCA Online Toolkit includes customizable signs and flyers for promoting your 31 Days Of Rescue Dogs Campaign. It also contains party printables like straw flags, donation jar labels, and paw print decorations! We also provide you with banners to use to promote your event on social media – like Facebook cover photos and Instagram images. Whether you are hosting an event or having a virtual fundraiser, we’ve got your ASPCA materials ready! Why should I fundraise with a 31 Days Of Rescue Dogs Campaign? The ASPCA is celebrating 150 years of helping animals in need, which means dogs of all shapes and sizes too! We hope you take advantage of this opportunity to make a difference in the lives of homeless, abused and injured animals. When you fundraise for the ASPCA, not only are you raising crucial funds to support our life-saving programs and initiatives, but you are also spreading awareness of the ASPCA’s mission to provide effective means for the prevention of cruelty to animals throughout the United States. And there is no fundraising minimum—a gift in any amount is much appreciated and goes a long way in helping our animal friends. What kind of 31 Days Of Rescue Dogs Campaign can I host? - Hold a bake sale, craft sale, lemonade stand or pie eating contest. - Organize a gala, wine tasting, bingo night or concert for the ASPCA. - Organize a neighborhood dog walk or pet parade. - Offer services to your neighbors for a donation - wash cars, babysit, mow lawns, shovel snow or pet-sit. Do I have to host a fundraiser event to have a 31 Days Of Rescue Dogs Campaign? No! Using social media, you can have a virtual, ongoing fundraiser. The easiest way to spread the word about your 31 Days Of Rescue Dogs Campaign is to send an email to close friends and family and post about your fundraising page on social media platforms like Facebook, Twitter, and Instagram. Make sure to include the URL to your 31 Days Of Rescue Dogs Campaign page. By having an online fundraiser, you can extend your donor network all across the country or even the world! The opportunities to help injured and abused animals are endless. If I am hosting a campaign event, what is the best way to collect donations? If you are hosting an event with a suggested donation to attend, the easiest way to collect these donations is through credit card, checking account or PayPal payments on your online fundraising page! Do I have to register/login first to start creating my campaign page and access the Online Toolkit? Yes, you must register in order to create your fundraising page and download the Online Toolkit. Is there a minimum age requirement for registering a campaign page? Yes, you must be at least the age of majority in the state where you reside. In most states, the age of majority is 18 years old, however, in a few states, such as Nebraska, Alabama and Mississippi, the age of majority is older than 18 years old. Creating a page requires registering your name and contact information with the ASPCA. If you are under the applicable age of majority, please ask your parent or guardian to register on your behalf. Where do donations made through my campaign page go? Online donations made on your 31 Days Of Rescue Dogs Campaign page go directly to the ASPCA. The donation amount will be shown on your page and 100% of the contributions will be attributed towards your fundraising goal. Donations made to the ASPCA are 100% tax-deductible to the extent allowed by law. 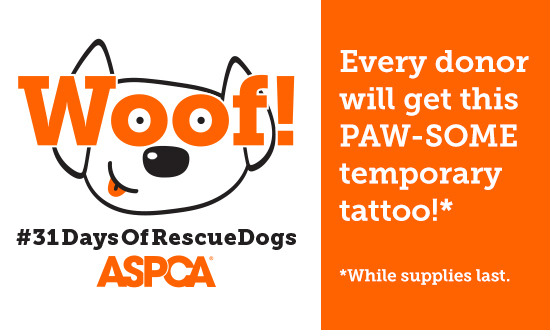 Donate to an 31 Days Of Rescue Dogs Campaign in the month of November and automatically receive a free limited edition ASPCA tattoo!